At the 1934 Paris motor show, Gaston Grummer exhibits his latest creation, a Renault Nervasport with a special body called “aeroprofil”. 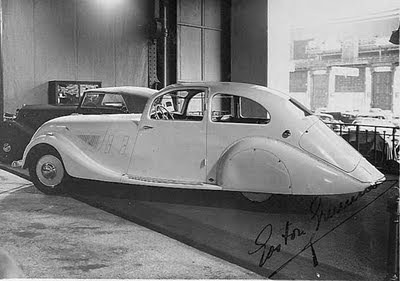 With the support of Guillaume Busson, a car designer specialist in streamlined bodies, Grummer first “aeroprofil” is a coupe on a Citroën Rosalie chassis and soon followed by a 6c1500 Alfa Romeo. During 1934, several “aeroprofil” are built among them two Renault Nervasport, one Hotchkiss, one Delage D8 that is sent to the New-York city motor show. Unfortunately, very few people will be interested by this style of car that is probably considered as too futuristic. The poor economical situation of France in 1936 is fatal to the Carrosserie Grummer which goes bankrupt the same year.